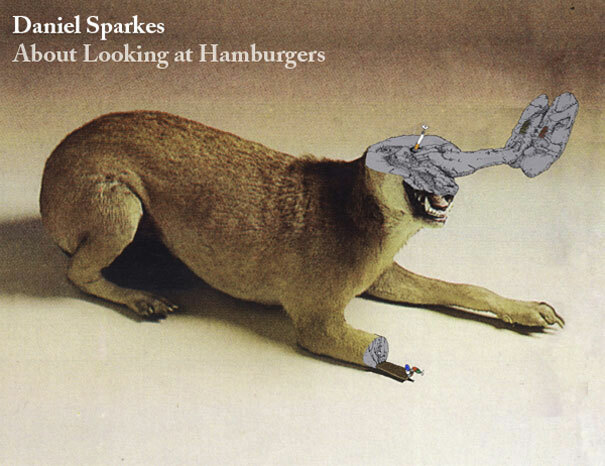 Galleries Goldstein is proud to present ‘About Looking at Hamburgers’, a new body of work by Daniel Sparkes. This show uses his characteristic fusion of the everyday with the fantastical to unravel man’s difficult, and often flawed, relationship with nature. Sparkes works in the emerging genre of Comic Abstraction, performing interventions into the mundane fabric of life by injecting it with darkly comic motifs. The quotidian becomes a vehicle for social commentary and critique as Sparkes infuses it with his cartoonish characters that falter uncomfortably in a space between Seuss and Disney. This is achieved through the corruption of found images, where Sparkes makes delicate ink drawings that invest the image with equal amounts of outrage and wonder. His early billboard works around Bristol were comprised of spray-painted appendages to advertisements that unmasked the banal absurdity of consumer culture. Sparkes brings to the surface a certain horror that simmers at the unanalysed subterranean level of culture, adding colour, vision and even magic to grim depictions of people, animals and landscapes.